Playmaker Luke Gale believes Castleford Tigers have a stronger squad this year as they look to back up the belief that 2017 can be a great year for the club. 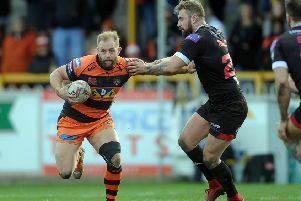 Gale has played in two fifth place finishing Castleford teams, but is confident that the off season recruiting has given them a real chance of improving in Super League this year. “We’ve got some strength in depth, we’ve got some key players back from injury and pre-season has gone a lot better,” he said. “We feel like we are in a good place and we’re ready for round one. “We’ve done our talking now, we’ve played our warm-up games and we are ready to roll. “We’ve all got that self belief. You can talk as much as you want, but you have to go and do it on the pitch. Gale admitted that some improving on the defensive side of their game has been needed at Castleford, but he is confident that the work being done in training will stand them in good stead. He said: “We know ourselves our defence has improved and it’s certainly one thing we’ll be focusing on this year. “We played Saints in our last friendly and they shouldn’t have scored. They only got one try at the end and it came from a 40-20 that we kept in. “We had a good result against Saints and I think the boys are ready to start now. “You can only prepare the best you can and we feel we have so we’re ready for Leigh in round one. On a personal level Gale is hoping for another good season to cement his place in the England World Cup squad. He added: “I’ve had a taste of it and my ambition is to make that England shirt mine for the World Cup. “I want to do exactly the same as last year, keep kicking on and keep improving and lead the team.